Upcycling or recycling is always a great way to give a second life to something. If you’re a music enthusiast, you can take one of your favorite instruments and turn it into a beautiful planter for your garden in just a few easy steps. Using flowers, succulents or any of your favorite plants, the possibilities are endless. Here’s how to DIY a recycled instrument planter for your own home. Certain instruments might work better than others for your plant container. Instruments with a wide opening such as a trumpet or a tuba are good ones to start with. There are also instruments that are easy to cut into such as a drum, violin or guitar. To prep a wooden instrument, you’ll want to use a weatherproof sealant. Make sure to heavily seal the inside to prevent water damage as well. A vintage brass instrument will naturally rust, adding to its vintage charm. To prepare the inside of your instrument, you’ll want to make sure there is proper drainage. Make sure the water has somewhere to flow out from. Next, you can line the inside of your planter with terra-cotta, pebbles, or moss to try help with drainage and soil retention. Once your planter is properly, drained, lined, and sealed, you’re ready to start filling it with your favorite plants. Succulents are a great option because they don’t require a lot of water. If you’re worried about rust, this is a nice choice. Some other popular container plants include Marigolds, Petunias, Ivy, Verbena, Zinnias, and Sweet Potato Vines. If you don’t have a backyard garden or a ton of space, you can still create a whimsical instrument planter on your balcony. 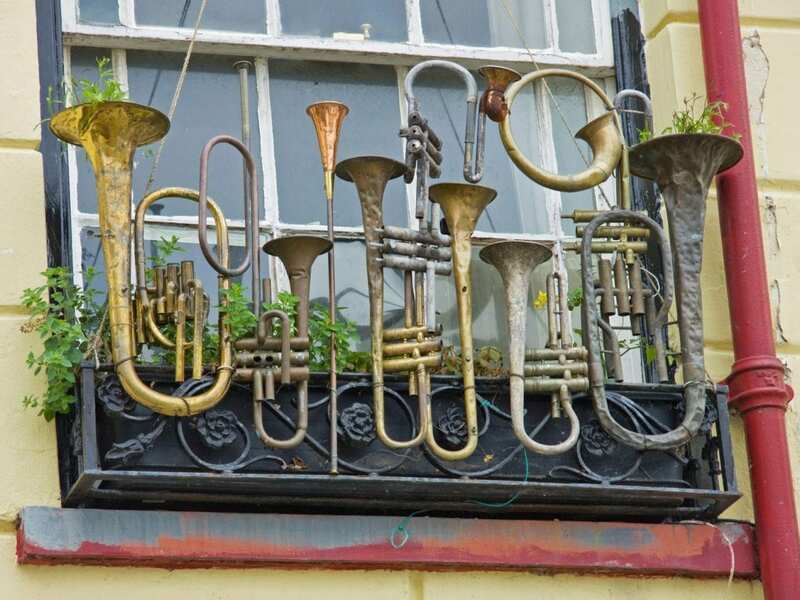 Using vintage instruments such as tubas, trumpets or French horns, you can adorn your window box or balcony with vintage horns. You’ll need to affix the horns using metal chains or something that can withstand some wind and weather. If you have the room, a piano makes a great base for your container garden. Not only is it grand in scale, but it can also hold a large variety of plants. Start by removing the chords, keys, and interior of the piano. You’ll need plenty of room for your plants inside. Once you’ve cleared the inside of the piano and weatherproofed it, you’re ready to start lining it with rocks, dirt, and your favorite plants. To help with the longevity of your piano, try placing it in an area that gets a good amount of shade. Keeping it out of direct sunlight will help to keep it from warping. A guitar can be used as a planter in many ways. You can cut it in half to add small plants along the side or you can drill holes in it to place plants in the top. You can also cut off the neck of the guitar and place it in a flower bed or shrub that is shaped like a guitar. Since guitars are a lighter instrument, they can also be hung over a patio or from a balcony. You can also attach them to the front of a wood planter box.